Driving over Caterpillar Hill the other day, I stopped to admire the granite monuments, with their snippets of local history that have been placed at the scenic turnout. They are magnificent; the etched photos are well chosen, and the accompanying texts are informative and well written. Clearly, those responsible, particularly Buddy Folino, deserve congratulations. Somewhat surprising is a total lack of mention of the people who lived in this region longer than any others. These are the local Indians, whose ancestors arrived at least 8000 years ago, and whose living sites are more numerous in and around Deer Isle than anywhere else between the Schoodic Peninsula down east and lslesboro to the west. Some of the adventures of Gluskabe, the great Wabanaki transformer, happened in places visible from Caterpillar Hill. 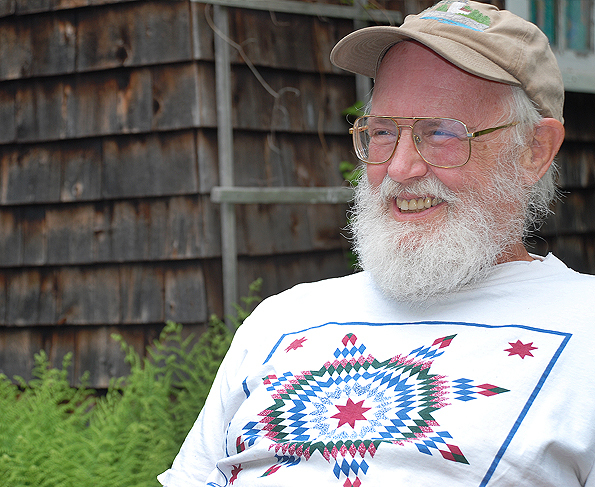 A well-known story has Gluskabe beaching his canoe at Castine to pursue a moose. Successfully making his kill, Gluskabe dressed out the carcass and then threw the entrails across Cape Rosier. They landed on Islesboro, where they may still be seen today. Similarly, the moose’s hindquarters can be seen on Cape Rosier, and Gluskabe’s canoe, as well as his snowshoe prints, were once visible at Castine. Also from Caterpillar Hill one gets a wonderful view of parts of a major Indian transportation artery. PHOTO: Bill Haviland’s Book Indian People and Deer Isle Maine sheds insights on Indians too. From Castine, they canoed up the Bagaduce and into Walker’s Pond, from which they carried across to the Punch Bowl on the Reach (probably the same route later used by the Maine Lake Ice Company to move the ice from Walker’s Pond to their wharf). From the Punch Bowl, Indians paddled between Deer Isle and Little Deer (the original Eggemoggin) and onto Deer Isle’s “inland waterway.” This gave them access to the islands further south, including Isle Au Haut where they quarried some of the stone used to make tools. Besides being part of an important transportation artery, Walker’s Pond was also the site of a small Indian village in the sixteenth and seventeenth centuries, a time when Europeans were becoming active in the region. Indeed, a battle was fought here sometime around 1660, when an English expedition sought revenge for the capture of a fishing vessel in the Reach. Europeans intruded and helped themselves to the Indians’ resources, setting off a chain reaction as each side sought revenge for perceived outrages committed by the other side. But not all contacts were hostile, as attested by the burial together, on an island off Sunshine, of a European in full armor (probably a Frenchman from Fort Pentagoet at Castine) with two Native companions. One other important site in the region is southeast of Caterpillar Hill at Naskeag. Perhaps the largest Indian site in the entire state, this was a gathering place for people from as far afield as Nova Scotia and Cape Cod. As many as 1000 years ago, these people gathered every summer at Naskeag point for purposes of trade between northern people, who lived by hunting, fishing, and gathering wild foods, and people to the south whose subsistence was based largely on farming. Indian activities in this region did not end with the arrival of English speaking settlers in the late eighteenth century. But that, as they say, is another story.